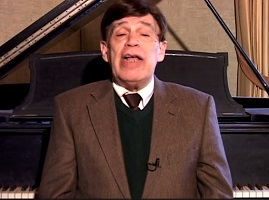 Dr. Miklos Rozsa, renowned Hungarian composer of music for films and the concert hall expressed his musical beliefs in his memoir, “Double Life.” He said, “I have no time for any music which does not reflect pleasure in life, and more importantly, pride in life.” His music, like his life, reflected great personal integrity. His musical career was extraordinary, because as one of the world’s most celebrated film composers, he was able to thrive professionally in the commercial motion picture industries in Paris, London, and Hollywood, without sacrificing that integrity. His “double life” allowed him to win Oscars for film scores such as “Ben-Hur.” All the while, he was writing distinguished concert works like his Violin Concerto, composed especially for the great virtuoso Jascha Heifetz. For Dr. Rozsa, music was not merely an intellectual exercise, nor was it simply a means of commercial success. Music carried a message to the listener from the composer and the performer. He was highly critical of modern composers who rejected the values of the past just to be fashionable. 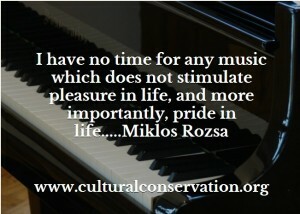 Miklos Rozsa’s standards in music would serve us well in every art and in life itself. Pride in life is sadly absent from much contemporary music and art. A true Cultural Conservationist seeks its return. Learn more about the life and music of Miklos Rozsa through Cultural Conservation. Click here!